1794 – The First African Methodist Episcopal Church is founded by Bishop Richard Allen of Philadelphia in Philadelphia, Pennsylvania. The church is the oldest African Methodist Episcopal congregation in the nation and was created after African-American members of St. George’s Methodist Church walked out due to racial segregation in the worship services. The church is now known as the Mother Bethel African Methodist Episcopal Church. 1794 – Slavery was abolished in France. 1864 – The 24th Amendment to the United States Constitution was ratified, abolishing the poll tax. 1913 – Rosa Parks (born Rosa Louise McCauley) was born on this day. Rosa Parks was born on February 4, 1913 in Tuskegee, Alabama. Thursday, December 1, 1955, in downtown Montgomery, Alabama, Parks boarded a bus driven by James Blake. When a white man entered the bus, Blake ordered the Blacks to move to the back of the bus. The other three Blacks complied with Blake’s order and got up and moved by Rosa simply moved laterally into the window sat. Blake asked her if she was was going to stand up, and she said, “No, I’m not.” Blake told her “Well, if you don’t stand up, I’m going to have to call the police and have you arrested” to which she responded, “You may do that.” Blake called for the police and she was arrested and taken to the police station where she was booked, fingerprinted and incarcerated. Parks was charged with disorderly conduct based on violating Chapter 6, Section 11 of the Montgomery City Code, which provided for segregation. She was found guilty and fined but her action of defiance symbolized the beginning of the civil right movement that began to get national attention. The resulting Montgomery bus boycott crippled the bus industry in Montgomery and forced it to change its segregationist seating policies. 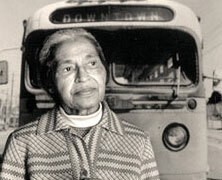 For more information on Rosa Park, view her profile on greatblackheroes.com. A stamp of Sojourner Truth is issued by the U.S. Postal Service. 2006 – Warren Moon is inducted into the Pro Football Hall of Fame, the first Black quarterback so honored.